For those of us in India, whatever happened in the US in 2014 should be our compass when viewing the marijuana ‘problem’. Prime Minister Narendra Modi’s very popular and necessary Twitter debate (#drugfreeIndia), which clearly indicated a lack of basic education about marijuana among many urban Indians, makes it even more important for Cannabeings to at least try and attempt to create a more studied view of the herb. Modi’s hashtag (if you allow a little digression, it’s funny that a debate on marijuana happens via a ‘hashtag’) threw up a curious bunch of anti-drug sentiments that appeared almost Nazi-like in its denouncement of ‘drugs’. There was no distinction being made: marijuana was put in the same deadly bouquet of heroin, cocaine, meth etc. It is like saying alcohol is as dangerous as absinthe. This is disturbing because it is a blinkered view of the issue which, obviously, is an effect of the narcotic and psychotropic substances laws (NDPS Act), which is also equally thoughtless and gives away the lawmakers’ ignorance. 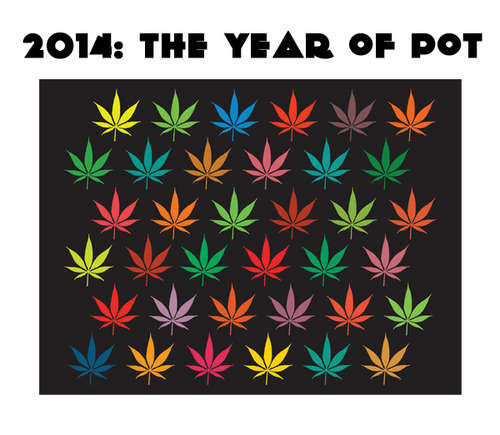 The year began with an historic moment: the first legally sanctioned sale of recreational marijuana in modern history. Swarmed by cameras and journalists at a planned media event, former Marine, Sean Azzariti, was among the first to make a purchase. He bought 3.5 grams of “Bubba Kush” for $40 and some pot-laced chocolate truffles for an additional $9.28. CNN Chief Medical Correspondent Sanjay Gupta said he was “doubling down” on medical marijuana after initially opposing the drug altogether. “I am more convinced than ever that it is irresponsible to not provide the best care we can, care that often may involve marijuana,” he wrote in a commentary on the evolution of his beliefs. His reversal, and a special he starred in, added high-profile legitimacy to the argument for medical marijuana. You can read all the 22 crucial events that Chokshi has detailed in his report HERE. Since we believe that cannabis is the true wonder plant, whose history is intimately connected to Indian culture since thousands of years, it is pertinent that we tell you that the religious significance of the herb is inextricably linked to its health benefits. It is surprising that Indians do not have any issues with marijuana at holy places or during festivals like Kumbh Mela or its use by sadhus/mystics like Gajanan Maharaj and Shirdi Sai Baba, but at the same time many see it as a dangerous ‘thing’ when it comes to being used by regular folks. The question of personal choice is conveniently forgotten despite our deep cultural connect with the marijuana plant. To top that, even with reams of research that proves that this plant is harmless when compared to tobacco/ alcohol/ cigarettes, that it’s infinitely safer than prescription drugs, that it is a natural relaxant, pain killer and that the hemp plant is an industrial powerhouse, we continue to rely on one-dimensional law quoting news reports in the mainstream media. The kind of damage that the nicotine in cigarettes, along with the countless other chemicals in it, has been well documented. The packets come with horrible warnings. Even then the government believes it is safer than marijuana. Doesn’t it make you think? Also, the damage that alcoholism does is far more dangerous than marijuana ever will be. We need to understand that everything can be abused, but that does not mean we ban something for it. No government has ever, in its right mind, considered alcohol prohibition. They talk about personal choice there, with which we agree. In places where there is a ban on alcohol, people procure it illegally. It would not be wrong to say that lesser the number of bans, higher the amount of collective happiness. Also, the police, the legal, and the prison systems get overloaded with work when a person is held for possessing, say, 10 grams of marijuana. That person is then sent to jail, and he does not come out any better. In fact, a stint in prison makes it hard for the person to land a job and make a life again. That’s not moral rehab by any stretch of the imagination. This also makes our already slow justice system even more lethargic. While killer stuff like brown sugar needs regulation, simply because it has no positive qualities as such, the debate on marijuana should not be considered in the same breath even with prescription drugs. Come to think of it, a McDonald’s burger is much more detrimental to our health and we do not mind fattening our children because we consider it to be ‘food’, despite all the science telling us all we need to know about this empty calorific monster. Even the mainstream media in the US is changing. The New York Times advocated for the legalisation of marijuana in a landmark six-part editorial, something that should awaken the media here. After all, an organisation as important and influential as the NYT would not take such a step, which most journos here would consider drastic, without getting their facts in order. You can read the NYT editorials HERE. In many ways, 2014 was the year of pot even for India because the first industrial hemp conference was held in New Delhi. The Indian Industrial Hemp Conference, organised by IIHA, saw many luminaries from the medical as well as industrial world launch a thoughtful debate on the uses of this resourceful and versatile plant. Since the law is mostly unenforced in India when it comes to marijuana (for religious reasons mostly), it would be safe to say that as a culture we know better and are ready to show the world the way forward, even America. The sad part is our laws are sometimes misused (often as vendetta) to criminalise an individual who may be perfectly sorted and even doing something beneficial to society like, say, a software engineer, a doctor or an artist. Would it make sense to send a young engineer to jail because he smoked a joint? We need to re-evaluate our ideas about marijuana. We need to see it as a mature society. We cannot let an imagined fear guide the journey ahead. The reason there are so many recreational and religious users in India is because there is supply, because people who use it know its benefits and do not feel it hampers their lives. There are abusers, yes. But that is the case with alcohol as well. So, what do we do? Do we grow up and realise our own history with this plant or do we sleep with our heads in the sand? So, let’s not choke good science, history and tradition with the wrong attitude.